I have been very fortunate to be involved with Para-Equestrian Dressage for a number of years. 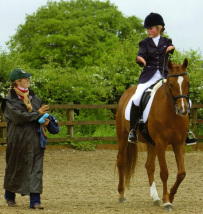 I came into the world of Para riders in 2007 when Emma Kent asked me if I would coach her with her lovely horse Gentle - who was shall we say was abit of a character to say the least, he did not always give Emma the easiest of rides! I worked with Emma and Gentle who were on BEF World Class Start Program for just over three years, during that time they won the Grade 3 Spring and Winter National Championships at home, as well as winning international competitions both at home and abroad. London Regional Squad Foundation Program. This was then replaced in 2011 by the BEF Excel Talent Programme, and this time I was invited to be the Para Discipline Coach, slightly different position this time as I now do the reviews, mentoring, profiling and program planning, I am on call to all the riders on the program. This really helps to prepare riders for the BEF World Class Program if they move up the next level. They have access to top assistance from physios, nutritionist for human and equine, sports physiologist, farrier, biomechanics, saddler and more. The selected riders on the program now come together in one venue for a series of two and one day training camps over a two year period. I have recently finished my 4 year term on the BD Para Committee - due to my involvement with Coaching I am also a UKCC 3 Coach and coach Educator I was invited to join the committee and set up the Para Coaches Pathway. At that point there was nothing in place to help Para coaches develop their own skills - more importantly there was nothing to help the riders locate a coach who they knew had followed a route. The pathway is not a credential but does let the rider know that all the trainers/coaches listed on the database have an up-to date first aid certificate, public liability insurance and have agreed to abide by the code of conduct as well as attending training days to keep up their own personal development. Nina Venables is now in my place and will lead the Pathway forward to the next level. If you wish to find a Para trainer/coach in your area do checkout the BD link below as there is a list with names and counties on it. I have always viewed para riders as equals in their own right and to those ends have always involved them in my mainstream entertainment productions, I am glad to see that this is happening more in other equestrian events such as The Spanish Riding School. trademarks of Tanya Larrigan and may not be used.